We could all use a little more Zen, especially here in Southern California where we often experience a hectic pace of life. 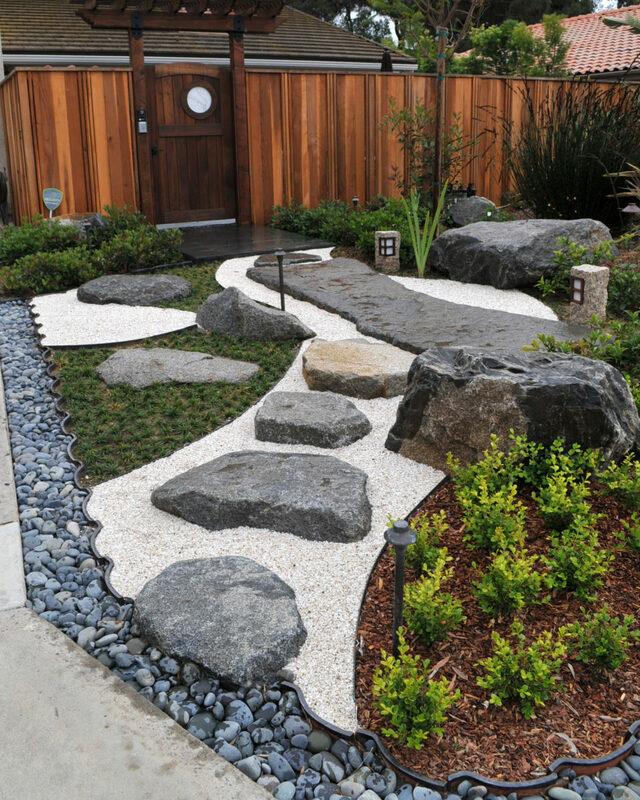 It’s no wonder that Japanese-style Zen Gardens are becoming increasingly popular. We all crave peace and simplicity, and more and more of us are finding it in our own backyards. Join us as we explore a 500-year-old tradition and outline how to make your own Japanese Zen Garden. Zen Gardens are a landscaping aesthetic associated with the Buddhist way of life. Often linked with tranquility and mindfulness, this type of design is often found in temples and royal estates. Monks would tend gardens as a form of meditation or contemplation, while the rich and royal would showcase their wealth and status by the lavishness of their landscaping. The oft-cited, quintessential example of a Zen Garden is the Ryoan-ji Temple in Japan. This burial place of emperors in Northwestern Kyoto is famed for its enigmatic rock garden. Within a modestly sized rectangular area, five sets of boulders seem randomly placed in a sea of white gravel. More than a million visitors a year come to sit and gaze upon this dry landscape. 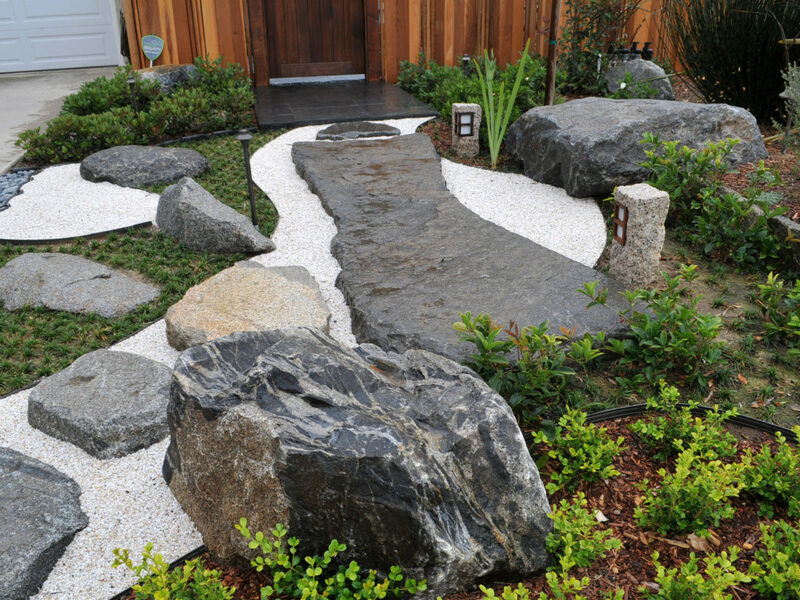 However, rock gardens are only one aspect of Zen design. 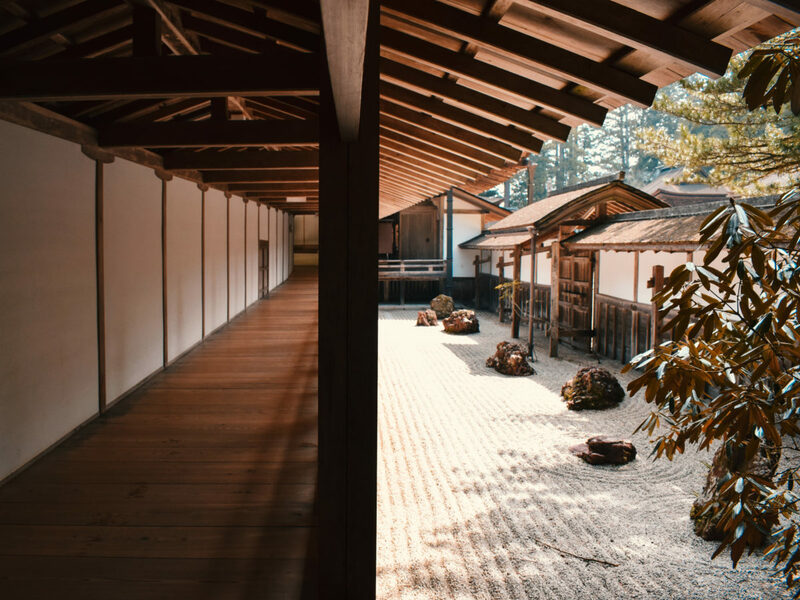 The concepts of tranquility and peace of mind have remained constant, but expressions of these ideas have evolved over time, exemplified in different ways through centuries of Japanese landscaping. For example, wealthier people began to add outdoor tea houses to mimic the journey to a place of spiritual pilgrimage. Outside of a traditional tea house, it was customary to wash one’s hands and mouth to cleanse before entering. 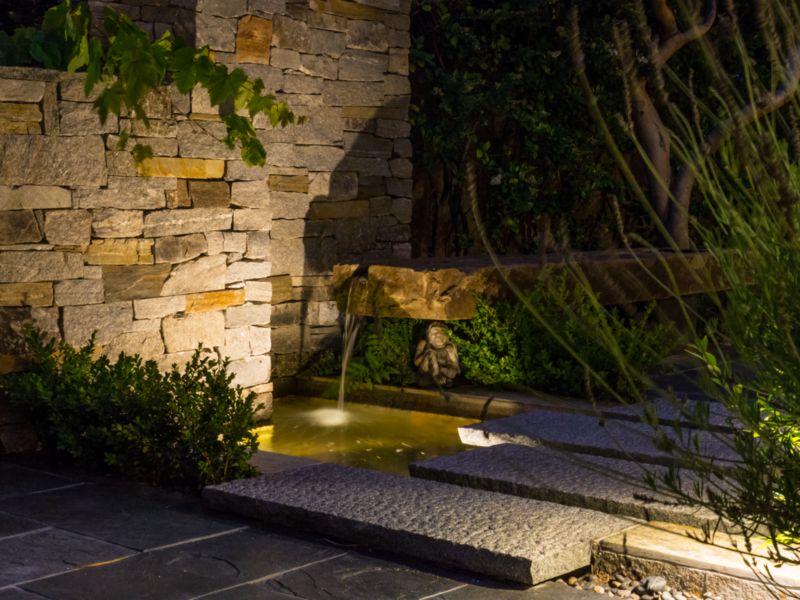 As a result, incorporating moving water became a staple of this garden design genre. Unifying these aspects of Zen garden design is one key idea. Capture this concept, and you’ll be on your way to understanding the principles behind Japanese landscaping. A Zen Garden is nature in miniature. The simple definition of a Zen Garden reflects the simplicity found within one. The goal when creating a garden is to copy nature in a myriad of ways. For example, crushed rock represents the sea, raked ridges are the ripples, boulders become mountains or islands, and small shrubs stand in for their taller brothers: trees. 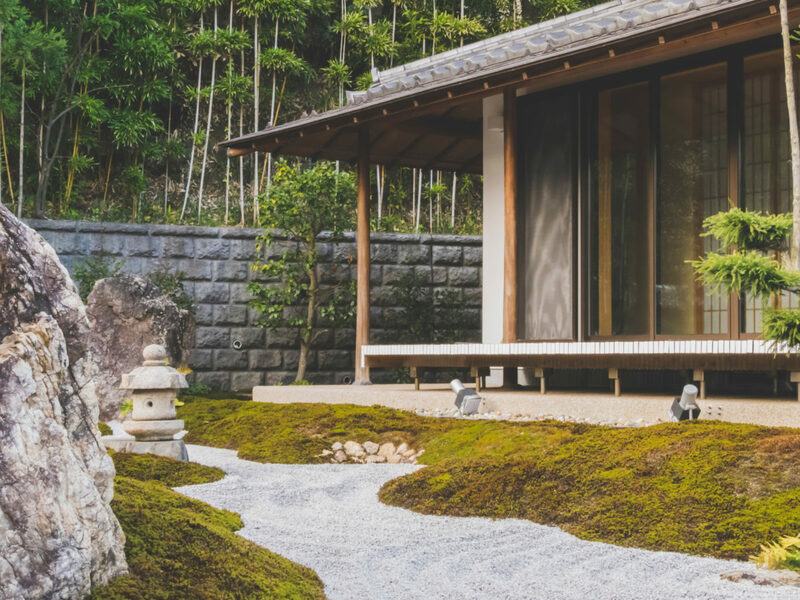 While this seems almost deceptively simple, master garden designer Kohei Owatari emphasizes that everything within a Zen Garden must in fact be very well-designed. Simply copying nature in miniature isn’t enough. One must take into account the surrounding nature that already exists and choose each element with care. We interviewed Kohei to discover more about his process for designing Zen Garden masterpieces and benefit from the insights garnered from his years of experience. Here’s what we learned from his expertise. 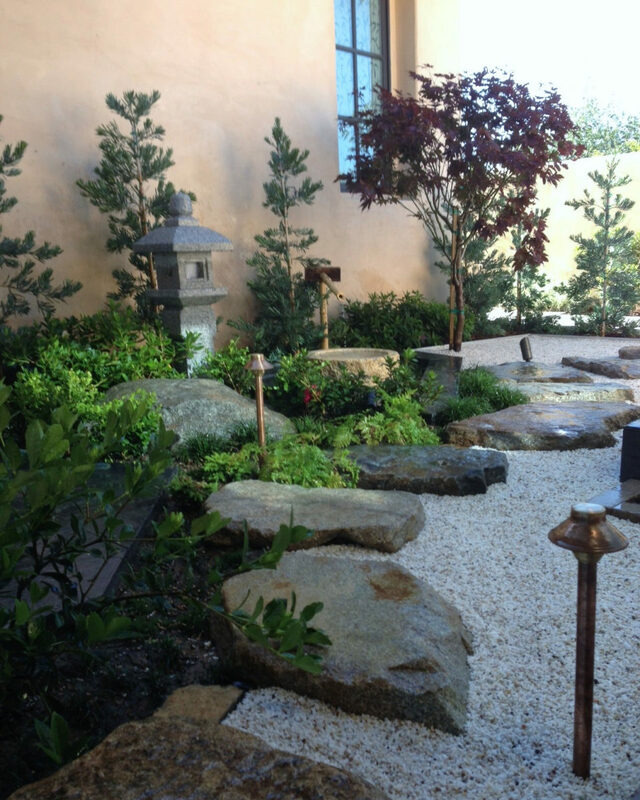 There is perhaps no other master Zen Garden designer in Southern California with Kohei Owatari’s pedigree. Formerly a gardener at the Japanese Royal House, Kohei was involved in maintenance and modification of the garden. 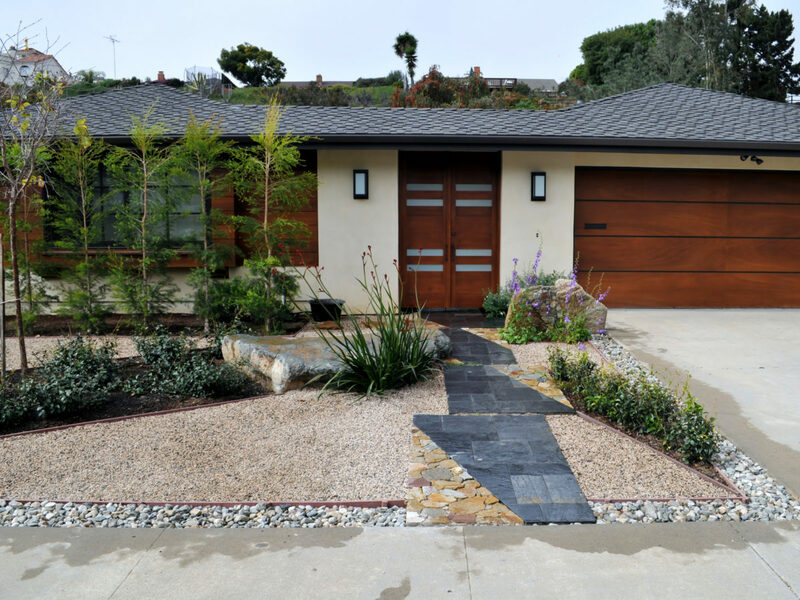 He recalls one particular project where a quarter-mile entryway was lined with a stone border of Mexican Beach Pebble. This project exemplified incredible attention to detail: every stone was individually chosen and polished by hand. We are fortunate that Kohei’s work is now much closer to home. 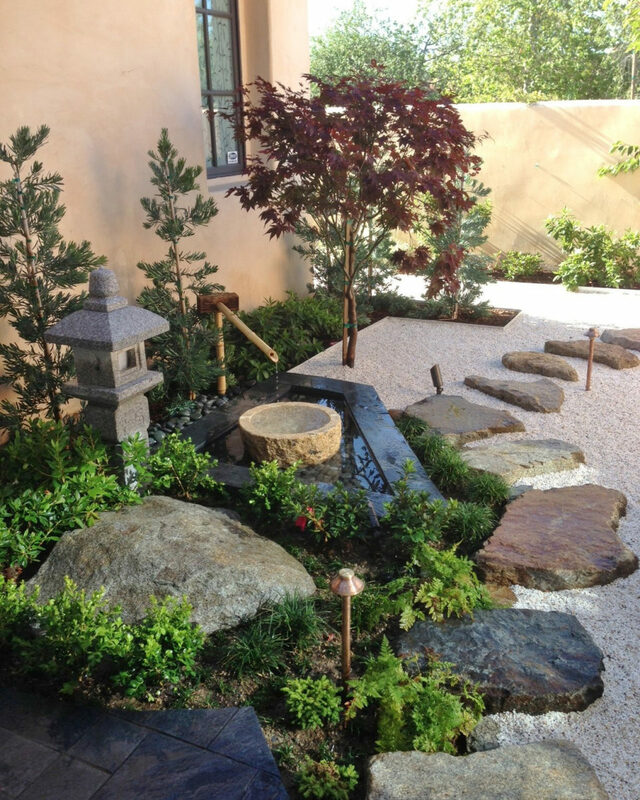 He founded his business, Modern Zen Garden, locally in Valley Center and quickly rose to prominence as the go-to designer for traditional Japanese landscaping and Zen Gardens. One of his projects was recently awarded the 2017 Garden of the Year from San Diego Home & Garden Magazine. While there are a number of other qualities that set Kohei’s work apart from the rest, his primary calling card is how he marries ancient and contemporary design. He takes ageless elements and adds a modern twist, adapting the traditional to the Southern California climate. 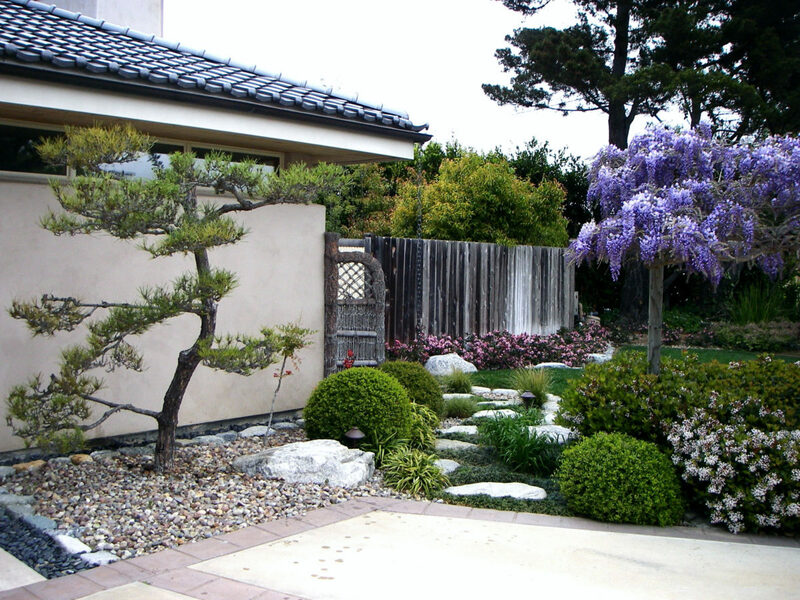 For example, Kohei makes Southern California-friendly plant choices throughout his Zen Garden installations (Keep reading for a detailed list of his favorites). Traditionally, Japanese gardens feature bamboo water fountains that fill and empty as the water cycles and gravity does its work. In California, however, using bamboo in this way is risky. Kohei takes note of our arid climate, observing that harvested bamboo doesn’t last long in dry air. Instead, he replaces this traditional material with natural stone, carving and hand-chiseling unique water features, or with copper pipes. Using stone fountains and adapting his plant choices ensures the garden will stand the test of time in SoCal, even in drier years. Pro Tip: Don’t make the mistake of using moss as your ground cover! Though often associated with Japanese Gardens, it doesn’t do well as a ground cover in drier areas like San Diego, Orange County and Los Angeles. 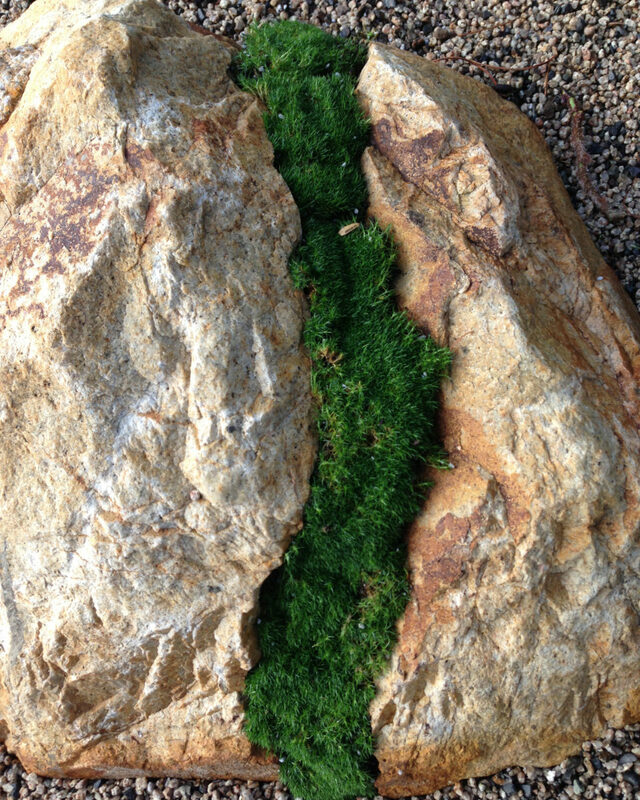 Moss is more suited to humid and rainy environments. Ground Cover: Dwarf Mondo Grass. Of course, Kohei Owatari is a master of his craft and his own unique and inspired style can’t be duplicated. However, he was kind enough to share with us a few of the guiding principles that have contributed to his success and sense of aesthetics. Here are his insider tips for achieving a beautifully designed garden that stands out above the rest. Always use water in motion. 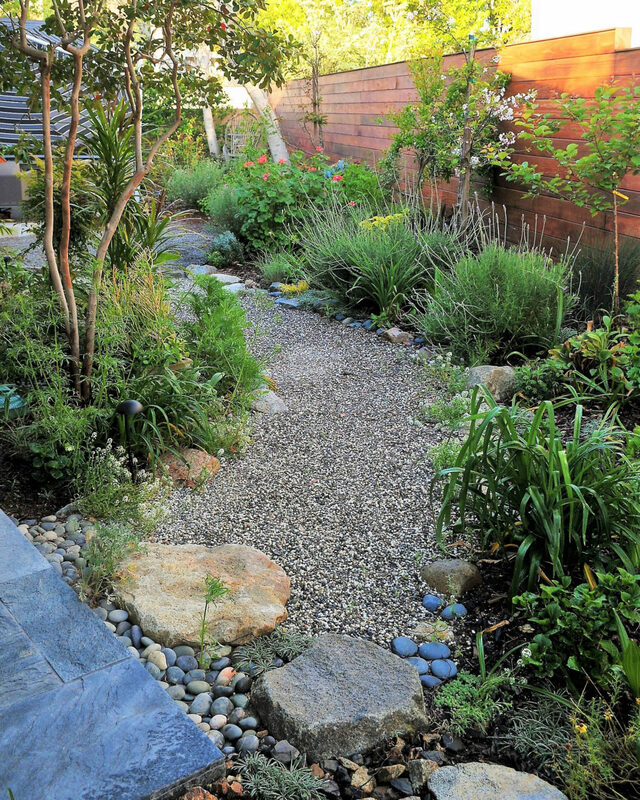 Find a way to allow water to move in your garden. This will bring life to your space and go a long way toward creating the relaxing space you’ve been imagining. Use other gardens for your inspiration, but ultimately allow your mind to create your own version of Zen Garden bliss. Your garden is unique. The area around your home or business is unique. Let your natural surroundings inspire and guide you as you create. Use odd angles, explore the unexpected. One of Kohei’s designs involved a boulder that had broken. Instead of throwing it away, he added a moss filling and created a new, interesting focal point for the garden. He also experiments with combining unlikely materials and unexpected stone shapes. Address your needs for functionality. Ultimately, your garden is for you. 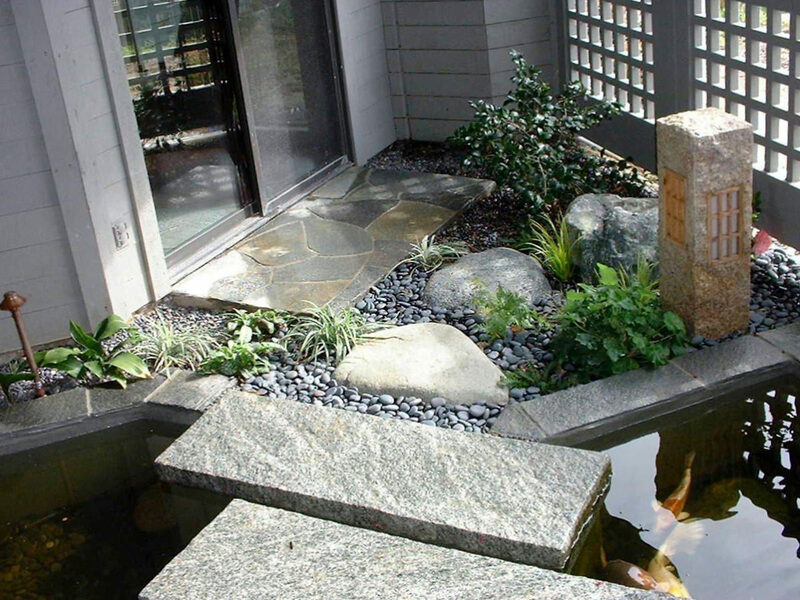 Combine the Japanese Zen theme with your own desires for a backyard space. For example, the Garden of the Year project incorporated a large entertainment area, leaf-shaped patio with a fire pit, barbeque area, bistro, and stepping stones and pathways to facilitate use. Apply thoughtful decisions to each aspect of your garden design. Attention to detail always shines through – your effort will be rewarded. 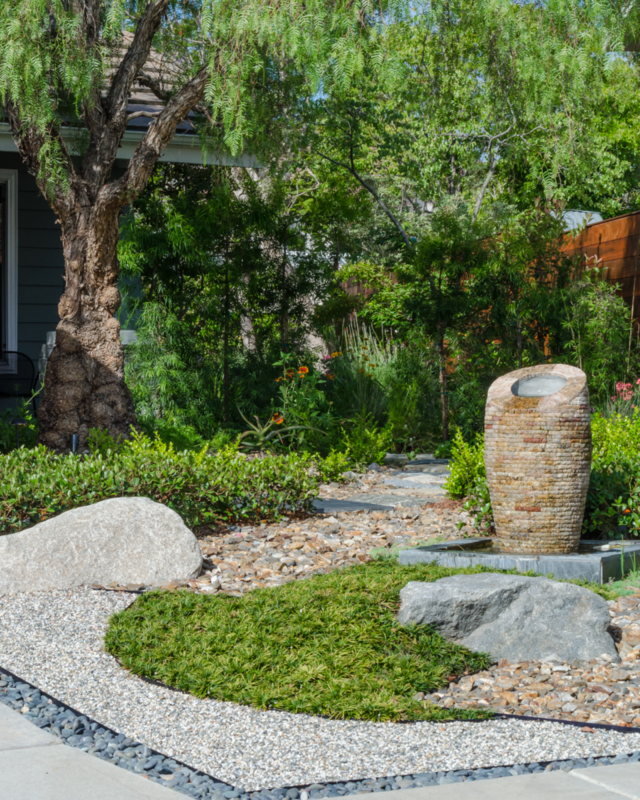 With Kohei’s tips in mind, here are seven steps to follow when creating a Zen Garden in your backyard. We’ve also added our tips on where to splurge and where to save if you’re on a budget. Decide on a Water Feature. Splurge! This is the centerpiece of your design, so if you’re going to invest anywhere, make it your water feature! Keep Kohei’s advice in mind and choose something that will last in a dry Southern California climate. 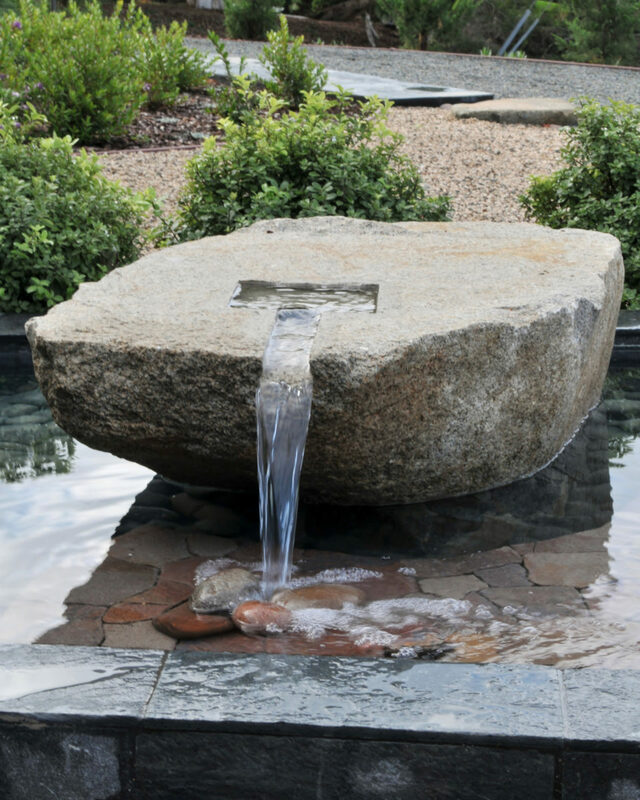 Hand-chiseled natural stone fountains are some of Kohei’s most talked-about garden elements. If you have a very large area to landscape, you might even consider a waterfall and/or pond. Draw out your plans for the garden. Now that you have chosen a water feature, you can plan other elements around it. Make sure to incorporate pathways to connect all your elements, and use spray paint to mark out where your boulders will be. Remove any debris or unwanted landscaping. Since your garden will be a work of art, you need to begin with a blank canvas! Splurge and Save! You may want to choose at least one central boulder that you really love, and it may be worth spending a bit more on it. Other boulders can be smaller and more budget-friendly if you desire. 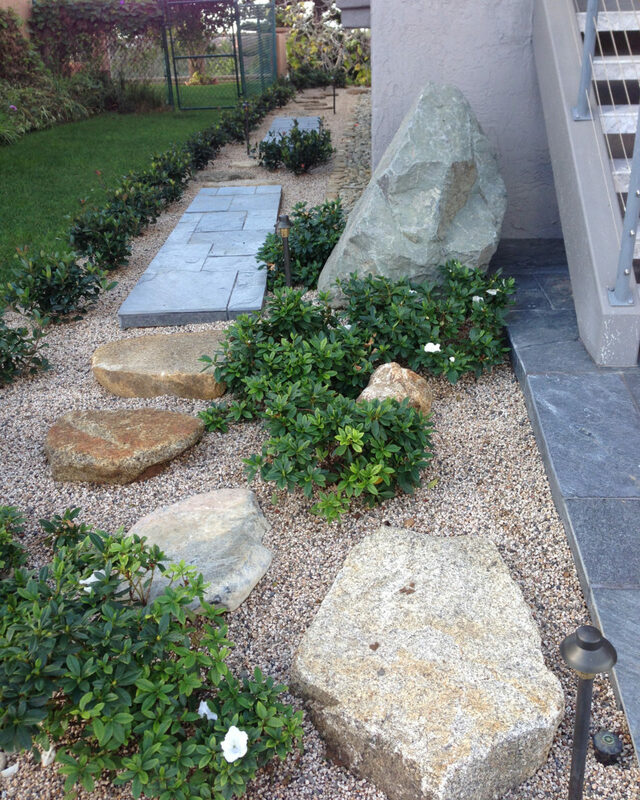 Think of them as islands in your garden-ocean, using both high and low-profile boulders in sets of 3 or 5. Placing boulders is the first step in your project. Make sure you are certain about where you want them to be – it’s a lot harder to move them later! Check out this blog post for more information on placing boulders. Save! 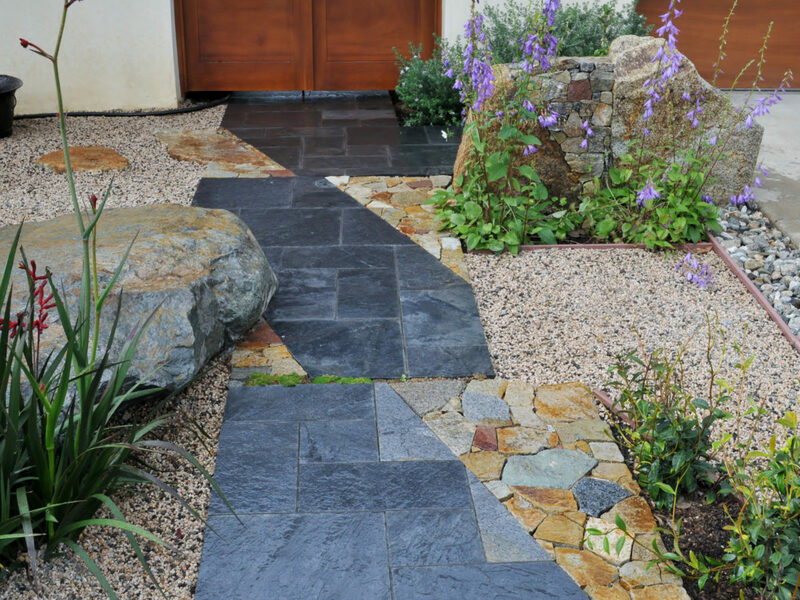 Use a crushed rock (commonly known as gravel) to cover walking paths and any larger areas. If desired, add stepping stones on top. Arrange the rock with a rake in areas not being walked on. This is your chance to create the ripple effect that evokes the feeling of an ocean. Spice it up with Stone Borders. Splurge a little. 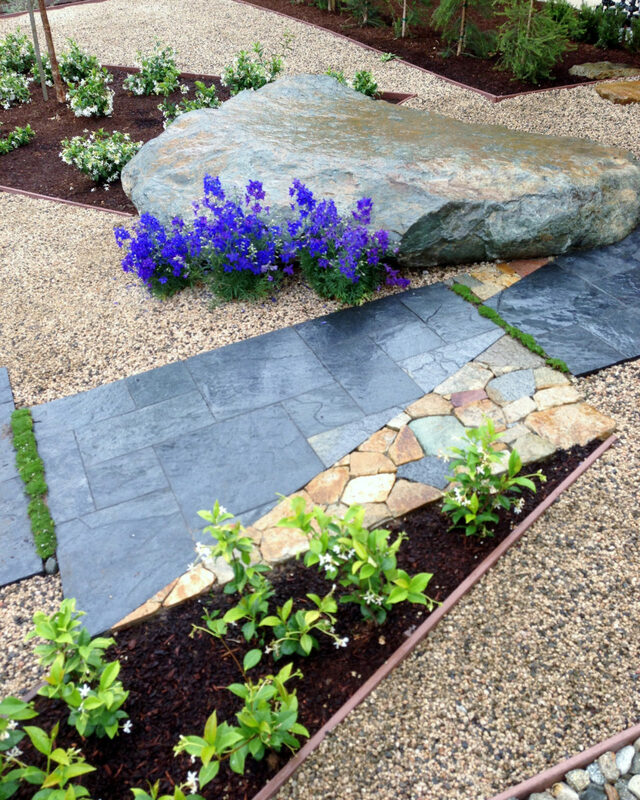 It is a Japanese tradition to include stone borders, along the edge of the house or along pathways. You only need small amounts of accent material, so spend a little more here on a polished pebble or rounded cobble like Mexican Beach Pebble. Save! Incorporating more decorative rock into your garden means you’ll need less plants to fill the area (and you’ll be saving yourself future maintenance!). Choose a few favorites to invest in, and refer to Kohei’s recommendations above to ensure your plants are able to thrive in a drier climate. You may have noticed that Japanese Zen Gardens involve a large amount of natural stone products. To help those of you who are new to the world of landscape rock, we asked Kohei to act as our personal guide to his favorite stone choices. Here are specific examples of his go-to products, plus what he looks for when visiting a landscape rock yard like Southwest Boulder & Stone. Kohei chooses boulders with muted colors like beige, gray or blue. 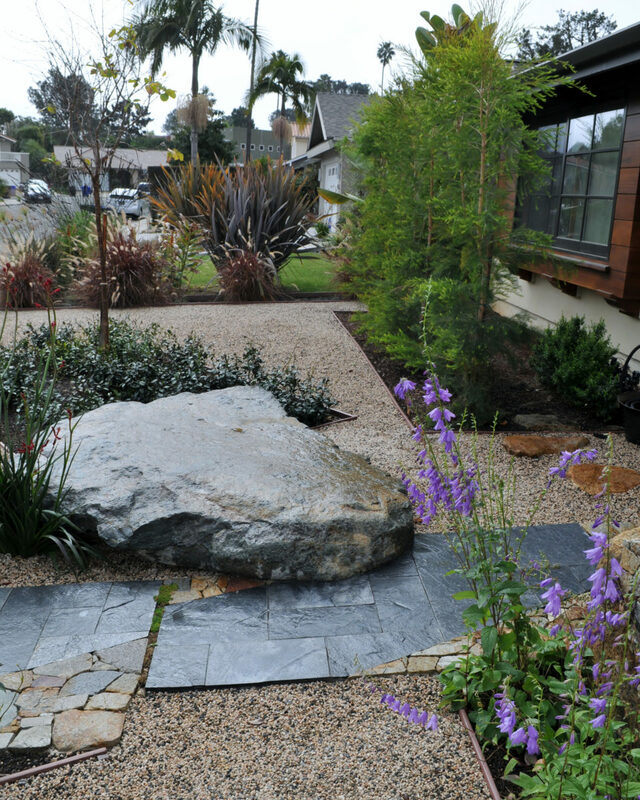 He avoids lighter boulders for his Southern California Zen Gardens because they tend to reflect sunlight and become too bright to enjoy. He prefers angular boulders rather than round ones, to better illustrate the mountains they represent in Japanese landscaping. Here’s an example of Platinum Gold flagstone Kohei used to cover an accent wall in the front yard of one of his Japanese Garden design projects. The beautiful stone privacy screen is also the backdrop for this project’s house numbers – another example of combining form with function. So, what it is like to work with Kohei Owatari as a landscape designer? Some of you may be considering hiring him for your own project, so we asked him about his typical design process. Kohei does offer consultations, perfect for people who want to apply his years of experience to their own backyard renovations. However, most of his clients hire him to both design and install their Zen Garden, which is his preferred method of working. Kohei finds that being involved in a project on a daily basis leads him to achieve higher levels of inspiration as the project develops. Many of his most talked-about garden elements are a result of something unexpected that happened during the project. His genius is truly revealed in the daily details of a project. Visit Kohei’s website, Modern Zen Garden, to learn more about his work. If you’re located in the San Diego, Los Angeles or Orange County areas, you can contact him to set up a consultation. 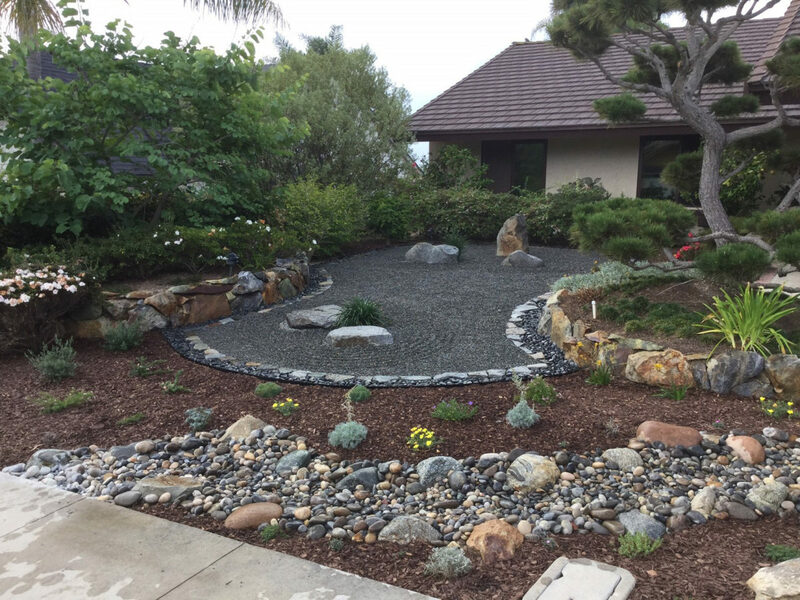 Armed with insider tips and expert advice, we hope you’ll attempt your own Japanese Zen Garden right here in Southern California. If you do, we’d love to hear about it! Comment below, or share it with us. We love to feature our customer’s projects on our website and social media channels.